Ships from Hong Kong. 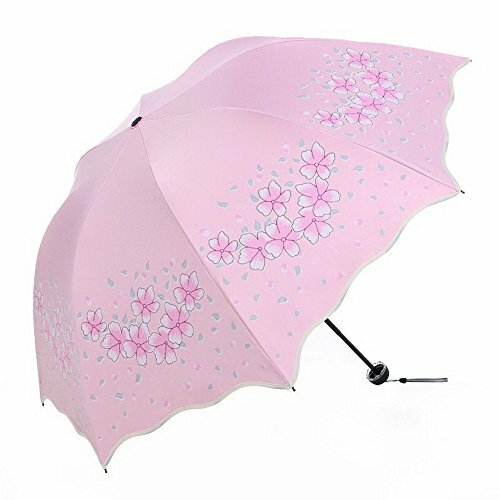 The folding umbrella's cover is made of polyester fiber, waterproof, wear-resistant, mildew proof. The umbrella rack is made of stainless steel, anticorrosive plating rust prevention. Anti-slip rubberized grip reduces hand and wrist fatigue when you need to hold the umbrella for a long time. And this umbrella not only can be used on rainy days, but also can be used in summer for sunproof, because its black vinyl fabric, have super UV barrier function. Perfect for travel, outdoors and everyday use! Materia: Stainless steel and vinyl fabric. Open span: 110cm/ inch, diameter: 98cm/ inch, height: 60cm/24 inch, folding size: 23cm/9 inch. Structure: Three floors compact folding structure with 8 ribs, one touch fast auto open and close. Feature: Windproof, waterproof, wear-resistant, mildew proof, anticorrosive and rust prevention. Multi-use: This folding umbrella is perfect for staying dry in heavy rain, or protecting you and your companions from the sun rays. Perfect for travel, outdoors and everyday use!